Chocolate Truffles are a rich and elegant, bite-sized petit four made from a velvety smooth mixture of chocolate, cream, and butter to which various flavorings can be added. A Chocolate Truffle mixture is really a Ganache that is rolled into mis-shaped rounds to look like the real truffle fungus that grows around the roots of trees in France and Italy. Once you form the rounds of ganache, traditionally they are rolled in unsweetened cocoa powder to simulate the 'dirt' that the real truffles grow in. However, for this Chocolate Truffle recipe I also tell (show) you how to dip the truffles in tempered chocolate and then roll them in various coatings (unsweetened cocoa powder, toasted and finely chopped nuts, and real chocolate sprinkles). Now, the taste of your chocolate truffle is primarily dependent on the quality of the chocolate you start with. A chocolate with a velvety smooth texture will produce a truffle that is velvety smooth. So use a chocolate that you would enjoy eating on its own. You can use either a semi sweet or bittersweet chocolate (which means a chocolate with a cacao content of between 55 - 70%). Once you have decided on your chocolate, you then need to decide on your choice of alcohol to flavor your truffles and also the coating. The choice is yours but there are a few things to consider. For example, if you want a hazelnut flavored truffle add Frangelico to the chocolate and cream mixture and then coat the truffle with chopped hazelnuts. Or if you would like your truffles to have a coffee flavor stir about one tablespoon of espresso powder into the hot cream and then add Kahua or Tia Maria to the truffle mixture. Orange flavored truffles can be made by adding about 1 tablespoon of orange zest to the hot cream. Let the cream steep for about 10 - 15 minutes and then strain out the zest. Then add Grand Marnier to the truffle mixture. As you can see there are endless variations to the basic truffle so experiment and come up with your own recipes. Truffles store very well. They can be refrigerated for a about one month or frozen for two months. Defrost in the refrigerator overnight. While you can simply roll the balls of ganache in your coating, I like to first coat the truffles in tempered chocolate. To temper the chocolate we are using the two step "seed" temper. You will need a chocolate thermometer as a regular candy thermometer does not have a low enough temperature reading. Step One is to melt about three quarters of the chocolate, and once the chocolate has melted and has reached a temperature of 115 degrees F (46 degrees C) it's ready for the next step. Step Two is to cool the chocolate down to a temperature of 90 degrees F (32 degrees C). This is done by gradually stirring into the melted chocolate the remaining finely chopped chocolate (this is called "seeding" because you are adding "seeds", or chopped chocolate, to the melted chocolate). Check the temperature often as you don't want the temperature to fall below the target temperature (and you may find you won't use all the finely chopped chocolate, or conversely, you may find you need to add extra chocolate). You can test to see if your chocolate is tempered. Use an offset spatula to spread a thin layer of chocolate on a piece of parchment paper and let cool. If it hardens and looks smooth without streaks, it is in temper. To hold the tempered chocolate at the correct temperature I like to use a heating pad (See video for demonstration). 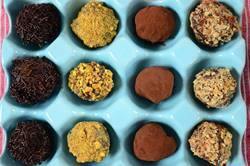 Chocolate Truffles: Place the finely chopped chocolate in a medium sized heatproof bowl. Set aside. Heat the cream and butter in a small saucepan over medium heat. Bring just to a boil. Immediately pour the boiling cream over the chocolate and allow to stand for about two minutes. Then gently stir with a heatproof spatula or wire whisk until smooth. If desired, add the liqueur. Let cool to room temperature and then cover and place in the refrigerator until the truffle mixture is firm enough to roll into balls (about 30-60 minutes). Next, remove the truffle mixture from the refrigerator. With your hands, a small one inch (2.5 cm) in diameter ice cream scoop, a melon baller, or a small spoon, form the chocolate into round or mis-shaped bite-sized one inch (2.5 cm) (15 grams) balls. If using your hands I like to wear non powdered latex gloves. Place on a parchment lined baking sheet. Chocolate Dipped Truffles: In a heatproof bowl, placed over a saucepan of simmering water, melt 1 1/2 pounds (675 grams) of the chocolate that has been coarsely chopped. Once melted, remove from the heat and check to see that the temperature of the chocolate is 115 degrees F (46 degrees C). Once at that temperature, gradually add the remaining 1/2 pound (225 grams) of finely chopped chocolate, stirring with a heatproof spatula, until a chocolate thermometer inserted about into the chocolate registers 90 degrees F (32 degrees C). (You may not use all the chocolate.) To keep the chocolate tempered, place the bowl into another larger bowl that has been lined with a heating pad wrapped in plastic wrap, set at the lowest setting (about 90 F (32 C)). Wearing gloves, take a room temperature chocolate truffle and dip it into the tempered chocolate. Then roll the truffle in your coating (unsweetened cocoa powder, finely chopped nuts, toasted coconut, or chocolate sprinkles). Place on a parchment lined baking sheet. Once all the truffles have been dipped and coated, you can let me set at room temperature or place the truffles in the refrigerator. Truffles can be refrigerated for one month or else frozen for two months. Defrost in the refrigerator overnight. Bring to room temperature before serving. Makes about 26 - 1 inch (2.5 cm) round Chocolate Truffles. Note: To toast the nuts, preheat your oven to 350 degrees F (180 degrees C). Place the nuts on a baking sheet. For pecans, walnuts or almonds, and bake nuts (pecans, walnuts or almonds) for about 8 - 10 minutes or until lightly brown and fragrant. For the hazelnuts bake for about 13-15 minutes or until the skins start to blister. Remove from oven and cover with a clean dish towel. Let the nuts 'steam' for about 10 minutes and then remove the skins. Once the nuts have cooled, finely chop.